If you are a prairie dog, it’s a good idea to keep on digging. 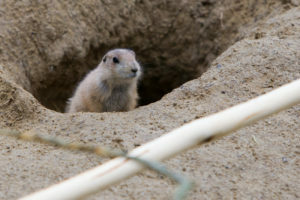 In fact the average prairie dog burrow is some 9’ underground, and up to 33’ long. But in retailing, we need to pay attention to the concept of sunk cost and quit while we’re ahead. The term sunk cost, also known as retrospective costs, refers to money spent that cannot be recovered. An example might be a sizable POS system investment that was made just a few years ago. If the store is no longer functioning smoothly with this technology, it doesn’t help to think about the money that was spent to install it. In fact, the sunk cost should not really have much bearing on deciding what POS system will best serve the store going forward. Buying a quality fixture from a vendor could be considered a sunk cost if you are not selling the line well and want to discontinue it. You may not want to violate the terms of agreement you signed about using the display exclusively for that company’s merchandise — but the amount spent on the fixture is not a good reason to continue buying the line. Another example of a sunk cost is the time and money spent training a new employee. If the staff member leaves, this money cannot be recovered. While it is probably not best to retain an unsatisfactory employee just to protect this investment, it is worthwhile to see if additional mentoring or a shift in job duties can turn the situation around. Advertising is always a sunk cost, because the money has to be spent before you know if it’s productive or not. Try testing two different versions of the same ad, or progressing cautiously so that you can gauge the feedback to an advertising campaign, to make sure your ad dollars are spent productively. The opposite of a sunk cost is a prospective, or future cost. Decision theory (did you know that there was such a thing?) suggests that only future costs should be considered when deciding a course of action. And while inventory acquisition is technically always classified as a future cost, according the the Investopedia, the truth of the matter is that as retailers we know that the failure of past inventory purchases has a lot to do with predicting the success of future purchases. When it comes to equipment, an employee, advertising or inventory, the lesson is the same. If something has not been successful, or is no longer successful, we must let go of the “sunk cost” — and not to keep digging ourselves deeper into the same hole.